Political status Non- sovereign, Overseas territory of the U.K.
Anguilla was first settled in pre-history by Amerindian tribes who migrated from South America. The date of European discovery is uncertain: some sources claim that Columbus sighted the island in 1493, while others state that the island was first discovered by the French in 1564 or 1565. The name Anguilla derives from the word for "eel" in any of various European languages (modern Spanish: anguila; French: anguille; Italian: Anguilla), probably chosen because of the island's eel-like shape. Anguilla was first colonised by English settlers from Saint Kitts, beginning in 1650. The island was administered by Great Britain until the early 19th century, when – against the wishes of the inhabitants – it was incorporated into a single British dependency along with Saint Kitts and Nevis. After a 1967 rebellion and brief period as a self-declared independent republic, it became a separate British dependency (now termed a British overseas territory) in 1980. Anguilla is an internally self-governing overseas territory of the United Kingdom. Its politics takes place in a framework of a parliamentary representative democratic dependency, whereby the Chief Minister is the head of government, and of a pluriform multi-party system. The United Nations Committee on Decolonisation includes Anguilla on the United Nations list of Non-Self-Governing Territories. 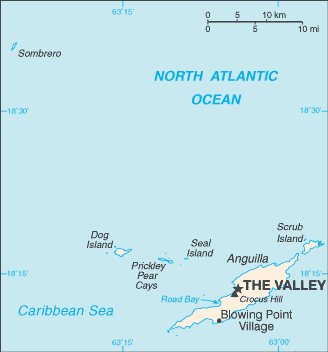 The territory's constitution is Anguilla Constitutional Order 1 April 1982 (amended 1990). Executive power is exercised by the government. Legislative power is vested in both the government and the House of Assembly. The Judiciary is independent of the executive and the legislature. Military defence is the responsibility of the United Kingdom. Anguilla is a flat, low-lying island of coral and limestone in the Caribbean Sea, east of Puerto Rico. It is approximately 16 miles long by 3 miles wide. The soil is generally thin and poor, supporting only scrub vegetation. 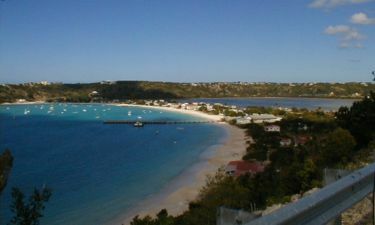 For a longer list see Geography of Anguilla. Anguilla has a tropical though rather dry climate, moderated by northeast trade winds. Temperatures vary little throughout the year. Average daily maxima range from about 27°C (80°F) in December to 30°C (86°F) in July. Rainfall is erratic, averaging about 90 cm (35 in) per year, the wettest months being September and October, and the driest February and March. Anguilla is vulnerable to hurricanes from June to November. Anguilla's thin arid soil is largely unsuitable for agriculture, and the island has few land-based natural resources. Its main industries are tourism and fishing, with the formation of offshore companies playing an increasingly important role in the economy. Anguilla's currency is the East Caribbean dollar, though the US dollar is also widely accepted. The majority of residents (90.08%) are predominantly black, the descendants of slaves transported from Africa. Growing minorities include whites at 3.74% and persons of mixed race at 4.65% (figures from 2001 census). 72% of the population is Anguillian while 28% is non-Anguillian (2001 census). Of the non-Anguillian population, many are citizens of the United States, United Kingdom, St Kitts & Nevis or Jamaica. The Anguilla National Trust, or ANT was established in 1993 to preserve the heritage of the island, including its cultural heritage. The Trust has programs encouraging Anguillan writers and the preservation of the island's history. The island's cultural history begins with the Arawak Indians. Artifacts have been found around the island, telling of life before Europeans settlers arrived. As throughout the Caribbean, holidays are a cultural fixture. Anguilla's most important holidays are of historic as much as cultural importance – particularly the anniversary of the emancipation (previously August Monday in the Park), celebrated as the Summer Festival. British holidays such as the Queen's birthday are also celebrated. Anguilla is the birthplace of Robert Athlyi Rogers, author of The Holy Piby. The Holy Piby has a large influence on Rastafarian beliefs, and to this day many Rastafarian activists such as Ijahnya Christian of Anguilla have praised Rogers as a key shaker and mover of the faith. Today, there are many "rastas" living on the island, and the influence of the religion spreads even to those who are not a member of it.